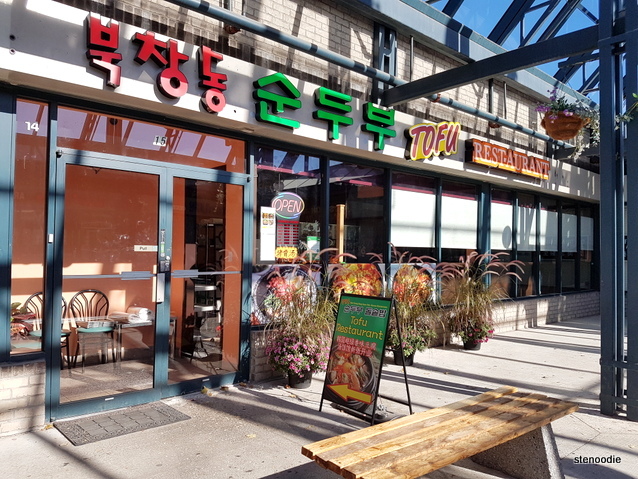 Having tried the first location of Buk Chang Dong Soon Tofu Korean Restaurant near Finch and Yonge three years ago now (time flies), when I saw that they had opened their second location in the Bayview and Hwy 7 plaza, I was eager to try it again. It was a nice to know that I didn’t have to trek all the way to North York for soon tofu anymore (yay!). 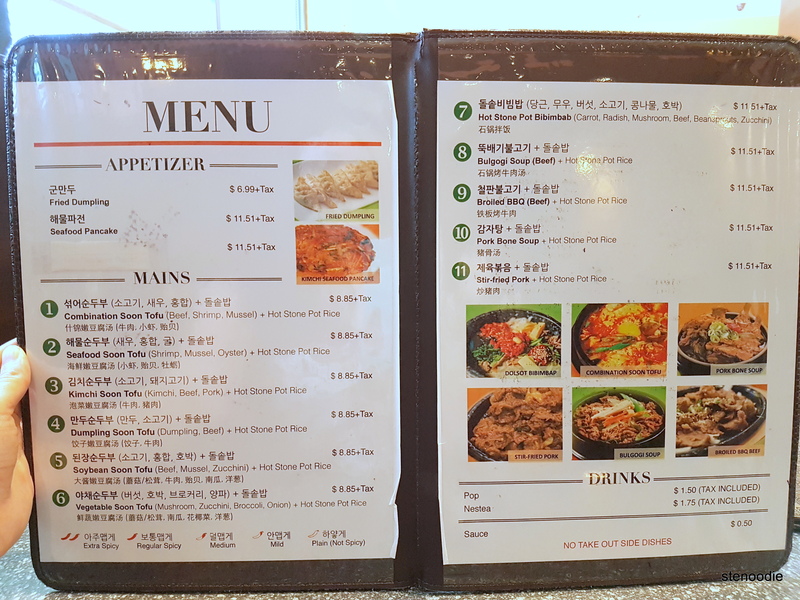 My mom and I went there for lunch after our usual Zumba lesson at 11:15 a.m., just as they had opened for 11 a.m. lunch service and we were the first to arrive. 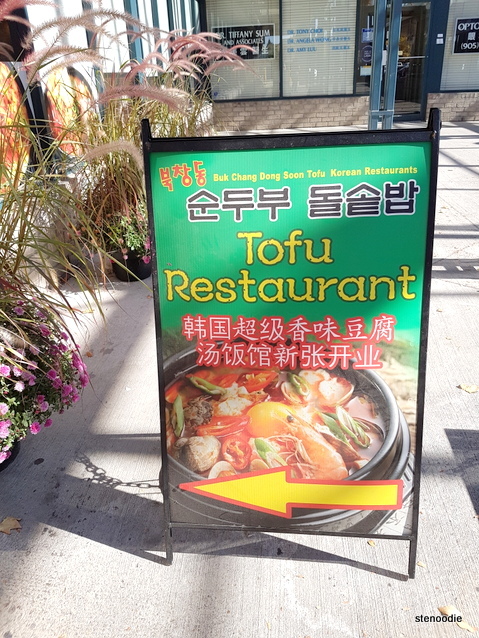 As I had remembered from the Yonge location, their soon tofu is remarkably smooth and they only serve a set number of items on their menu — no need to think too hard about what to order. It was exactly the same way here. (They had free wifi here! Ask the server for the password.) After placing our orders, it did take some time for the food to be served. The servers spoke Korean. We ordered #2 and #4 on the list. 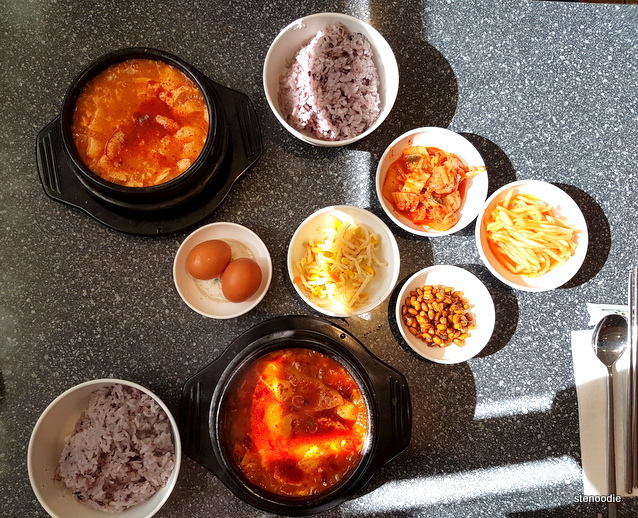 In addition to soon tofu paired with various items from #1 to 6, they also served bibimbap and other typical Korean dishes. Each of the first six items of soon tofu cost the same ($8.85). 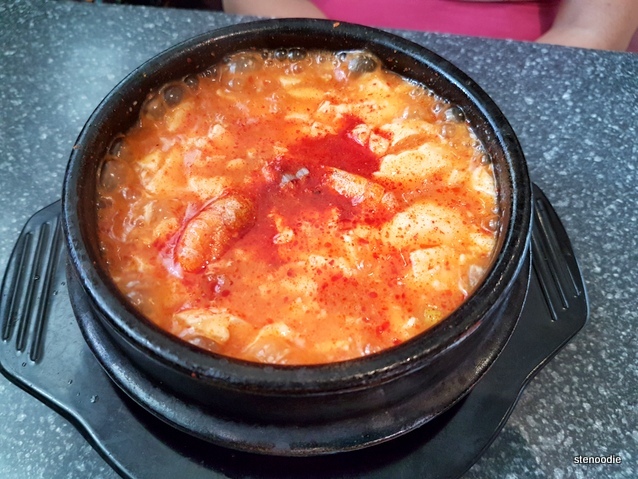 Before too long, our bubbling hot pots of soon tofu arrived. 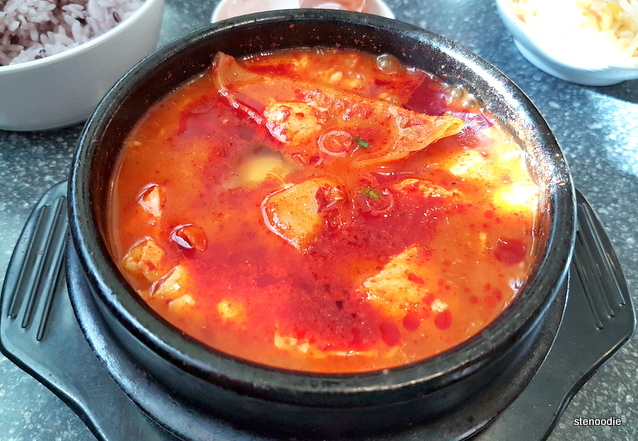 The seafood soon tofu was a medium spicy while the dumplings and beef soon tofu was extra spicy. 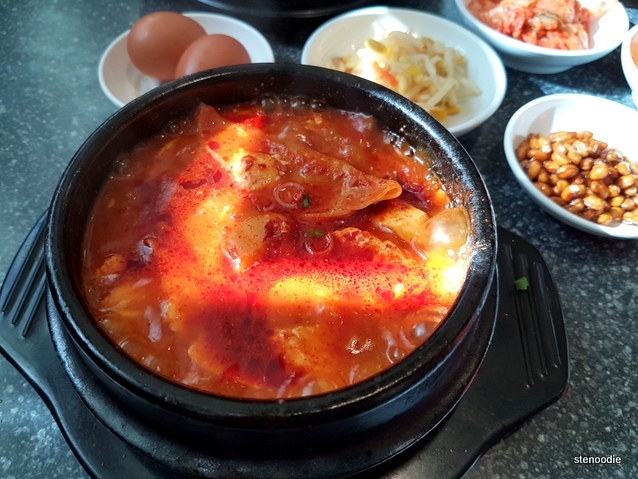 The soon tofu came with a stone pot with rice and four types of banchan to share. Our spread of Korean banchan and soon tofu! The soon tofu was as smooth as I remembered. 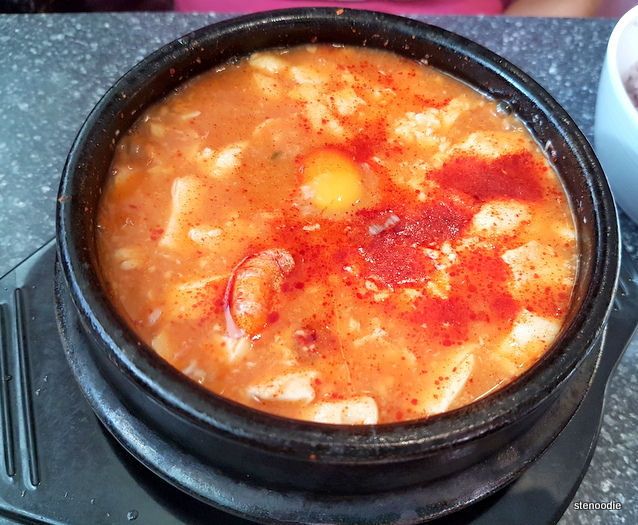 As the soup was bubbling, the server informed us to add in the eggs to the soup so that it could cook while it was still hot. She scooped out the rice for us in a bowl and poured in water into the empty stone pot so that the rest of the rice in the pot would be easier to scoop out later. 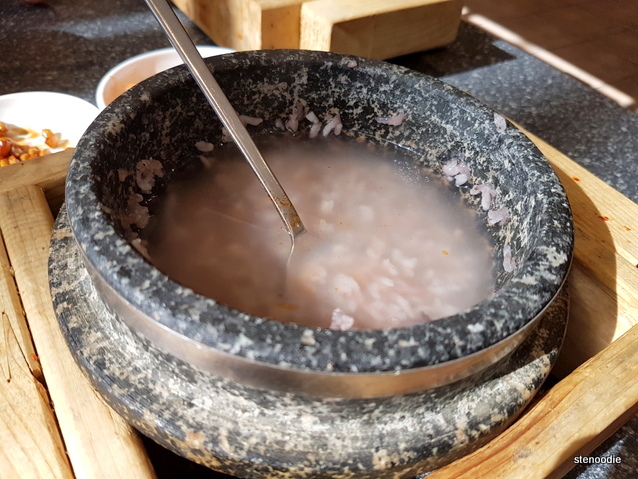 After the rice was scooped out from the hot stone pot, water was added into it so that the remaining rice sticking to the stone pot would loosen up and be easier to scoop out in several minutes’ time — no waste! 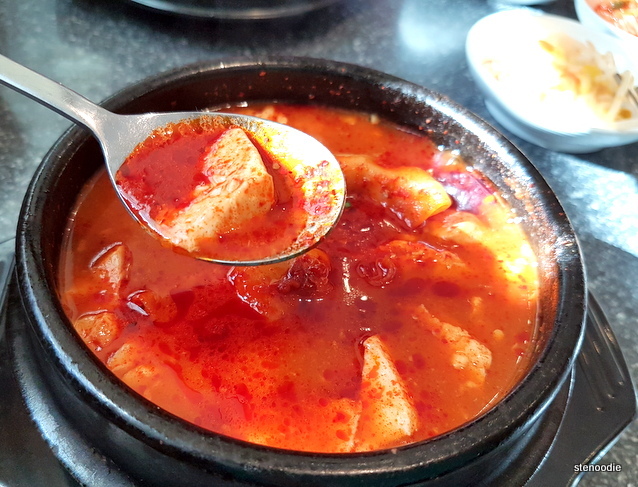 The extra spicy soup actually wasn’t too hot. It was super tasty and I loved slurping the soup. Everything was so delicious. I especially liked the dumplings (two came in the pot) in the Dumpling Soon Tofu. The beef could have been more raw but it was still good. In the Seafood Soon Tofu one, there were two tiny shrimps with its shell still on, a mussel, and a tiny oyster that actually dissolved into the soup (lol). All in all, it was a delicious meal and they served substantial portions! 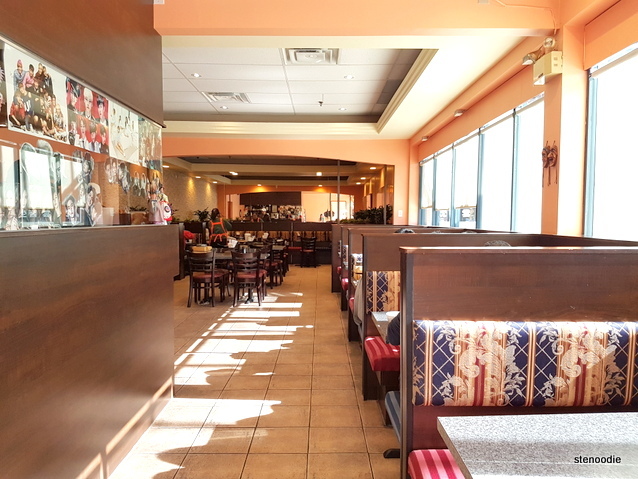 So if you don’t want to head down to the Yonge location for some smooth soon tofu, this Bayview location is perfect! 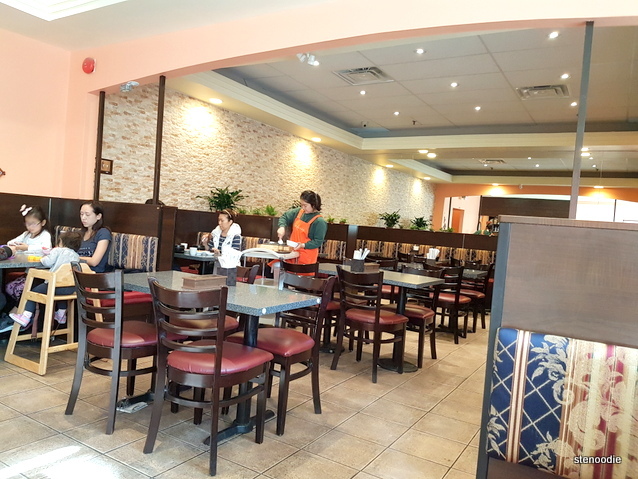 This entry was posted in Food and tagged 9019 Bayview Ave #15, Bayview location, Buk Chang Dong menu, Buk Chang Dong Richmond Hill, Buk Chang Dong Soon Tofu Korean Restaurant, Buk Chang Dong Soon Tofu on Bayview, buk chang dong soon tofu richmond hill, Dumpling Soon Tofu, food blog, foodie, free wifi, Hot stone pot rice, Korean, Korean restaurants in Richmond Hill, restaurant review, Richmond Hill, Seafood Soon Tofu, soon tofu, soon tofu in Toronto, where to eat soon tofu in Toronto. Bookmark the permalink. This place looks sooooo good! I need to check out the downtown location!